Among the most distinguished classical artists of his generation, clarinetist Jon Manasseis internationally recognized for his inspiring artistry, uniquely glorious sound and charismatic performing style. 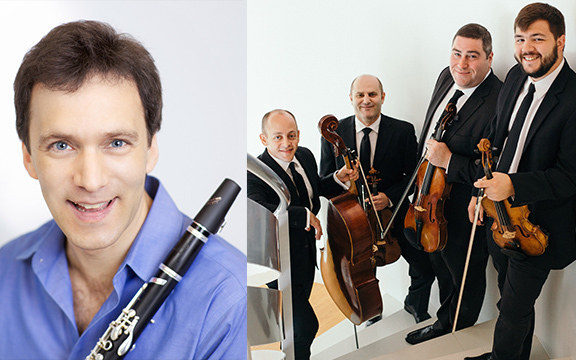 Clarinetist Jon Manasse has been a Juilliard faculty member since 2007. He has had numerous solo, concerto, and chamber music appearances in the U.S. and around the world. He is principal clarinet with the American Ballet Theater Mostly Mozart Festival orchestras. He was formerly principal clarinet with the New York Chamber Symphony and served as guest principal clarinetist of the New York Pops, Orchestra of St. Luke’s, Orpheus Chamber Orchestra and New Jersey, St. Louis, and Seattle Symphony orchestras. Manasse has appeared as a guest clarinetist with the New York Philharmonic in concerts conducted by Valery Gergiev and André Previn, and, during the 2003-04 season, served as the principal clarinetist of the Metropolitan Opera Orchestra. He has the been artistic director, with his duo-partner, pianist Jon Nakamatsu, of the Cape Cod Chamber Music Festival, since 2006. Manasse received his Master of Music degree from Juilliard, where he studied with David Weber.